CreditDonkey identity theft survey reveals surprising number of consumers continue to ignore the need to be vigilant about online security and protecting their identity. More than 3 in 10 share their password with a friend. Nearly 25% add “friends" on Facebook who they don't know. Two thirds of consumers, some 68.4%, use the same password for multiple websites. The survey paints a gloomy portrait of consumer attitude toward the real dangers of identity theft. "The threat of identity theft is real, yet consumers continue to behave as if the danger is only other people's problem," says Charles Tran, founder of CreditDonkey. CreditDonkey.com conducted the nationwide online survey of 510 Americans in May. 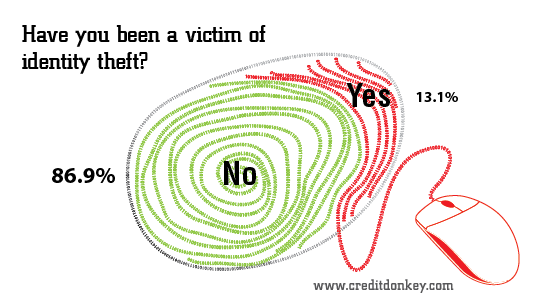 13.1% of respondents have been a victim of identity theft. 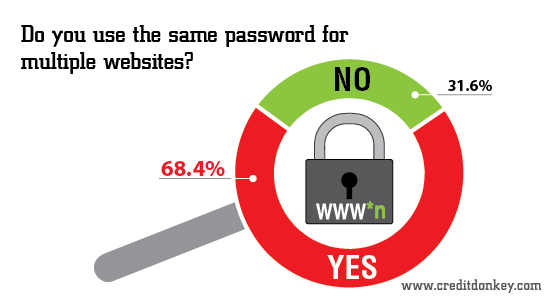 68.4% of respondents have used the same password for multiple websites. 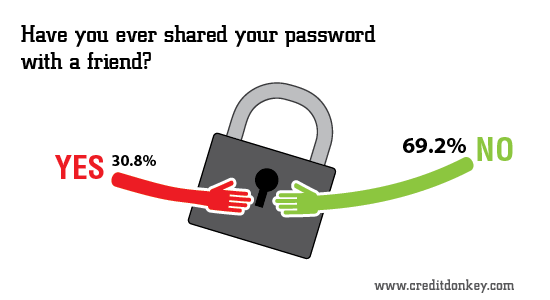 30.8% of respondents have shared their password with a friend. 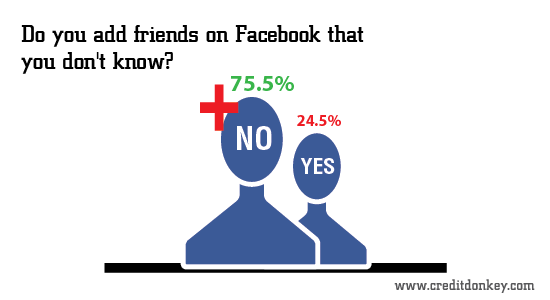 24.5% of respondents have added friends on Facebook that they don't know. 71.8% of respondents know that losing a social security card has the potential to cause the most harm when in the hands of an identity thief, compared to losing a credit card or driver's license. 65.5% of respondents know that a credit freeze prevents new accounts from being opened in your name. 76.3% of respondents know to check their credit report to find out if someone has opened a new line of credit in their name. Only 33.3% of respondents know a fraud alert does not prevent thieves from using existing credit cards or other accounts. 26.9% of respondents are under the false impression that placing a fraud alert or credit freeze will negatively affect their credit score. Another 18% of respondents are under the false impression that placing a fraud alert or credit freeze will prevent them from accessing their own credit report. "In reality, identity theft can strike any of us, and just like you shouldn't leave your front door unlocked, you should take basic precautions to protect yourself," advises Tran. Don't forget to view our infographic on how to protect yourself from identity theft. This is such a awesome post, Thanks for sharing the post to protect us from identity theft. BTW thanks for stopping by on my blog. Share on Facebook "Survey: Password Statistics"